Here we are in mid-March and still talking about snowstorms....certainly not an unusual occurrence, but we all seem particularly weather-weary this year. Let's hope Vulcan's 12" dump was the last significant snowfall of the season. Reading// Middlemarch... I'm enjoying this cast of characters very much and hope to hit the 50% mark by the end of the weekend. Listening// Middlemarch, again. I decided to go the total immersion route and downloaded Juliet Stevenson's narration. I will finish this book... hopefully by the end of the month. Watching// The Syracuse Orangemen choke in the homestretch. I know injuries are a factor, but they really crashed and burned at the ACC tournament. Mercifully, our power went out with under two minutes left in the game so we couldn't see the bitter end...most notably those six missed shots in their final offensive possession. Today is Selection Sunday, so I'll be watching the brackets fill in this evening. On to the Big Dance. And you guys were right - I'm loving Call the Midwife. In the kitchen// Yesterday I posted a recipe for the Easy Fish Piccata I mentioned in last week's Sunday Salon. I'm happy to report it turned out just as well the second time. 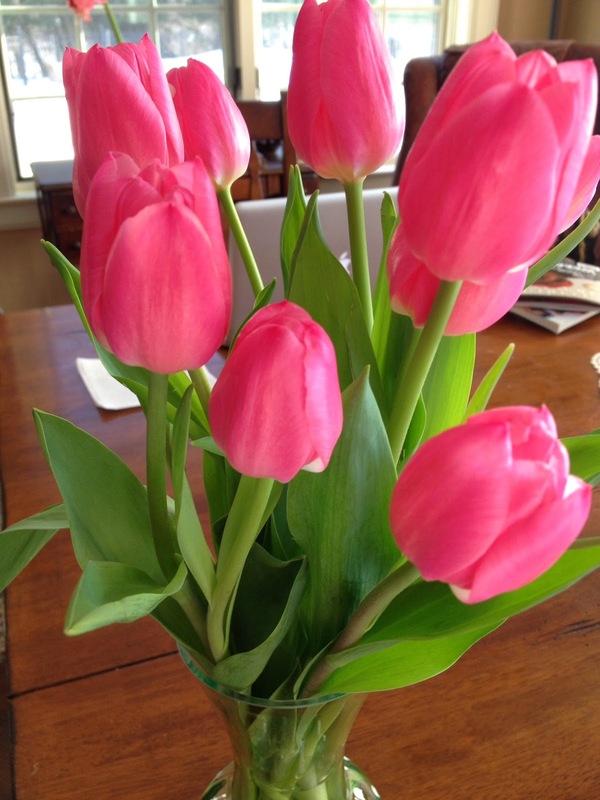 Loving// The pretty pink tulips I picked up at Wegmans this week. A gorgeous display was set up just inside the front door... how could I resist? They offer a striking contrast to all the white outside. Anticipating// A trip to Florida on Friday! Twin A is on spring break and will join us the first week... I will very happily trade all this snow for sand. Blogging// A regular week ahead, but I'm not sure how much I'll be around once we get to Florida. Internet access is still an issue, but I will have my laptop and plan to make several trips to the library or coffee shop. 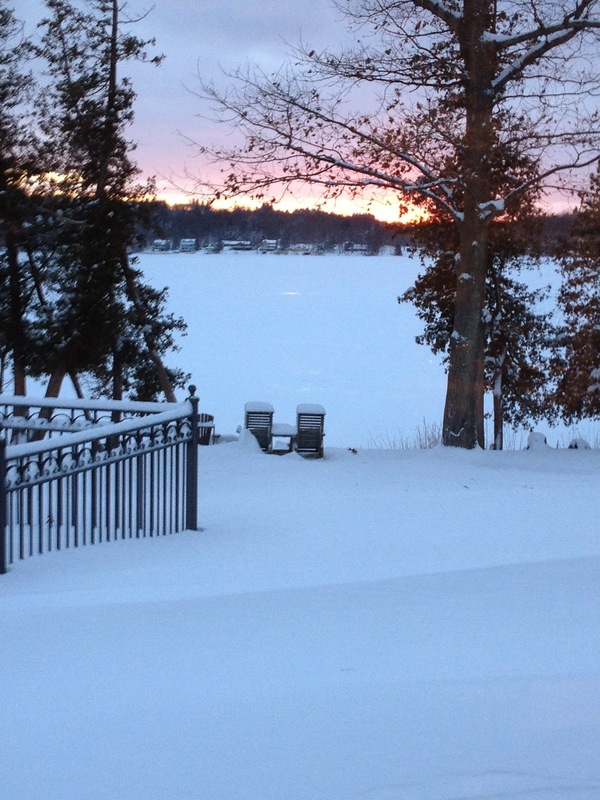 I am jealous of you going to FLA. i hope the snow has stopped for good this year where I live too. Someone was commiserating with me about our cold and snowy winter but I know we've had it easy compared to a lot of people (we've dodged storms S-V :)) I'm glad you're enjoying Middlemarch! I downloaded it from Audible a while ago (haven't listened though) and I hope against hope that I got the Juliet Stevenson version...if not, I'm buying another! P.S. just checked - I've got the Juliet Stevenson version. Happy!! Yeah, the end of that Syracuse - NC State game was ugly. Keep warm!! Your tulips are beautiful! Now I want to buy some. Today I'm hoping to finish most of my homework. Enjoy your day. Vasilly - Those tulips have lasted nearly a week... the best $6 I've spent in ages! Are you packing other books besides Middlemarch? I'm sure you are more than ready for the beach. Spring break here has been windy & wet, but at least no snow. Lovely photos of the Tulips and snow! Have a great week! Thanks, Pat. Hope you have a good one, too! I'm jealous of your trip to somewhere warm! Although we at least don't have any snow left on the ground here. Carrie - Spring is so slow to come to this part of the world. I live in a slightly higher elevation, too, so we're another 2 weeks behind even Syracuse. Enjoy the sun and sand! The tulips should keep you going till Friday! Our snow is mostly gone, but it's still cold! Laurie - Thanks, I sure will! Hope you get a warm up soon, too. Unbelievable that you still have all that snow. We still have snow "banks" but the grass is pretty clear. Have fun in FL. Those are such gorgeous tulips. We have dozens of daffodils in our yard, which will be in bloom next month, but the squirrels favor the tulips, so we only have a few. I should just buy them at Trader Joe's! I hit the halfway mark in East of Eden this weekend and I'm really enjoying it. I can't wait to watch the movie, once I've finished. Enjoy your get-away to Florida! I'm off to Oregon in 2 weeks. Not quite as warm as you'll be, but at least I'll be near the ocean again. Les - The squirrels ate every tulip I've ever planted, so I gave up and just enjoy the daffodils. So glad you're enjoying EoE - Steinbeck is a favorite of mine. I'm sure you're counting down days until your trip...there's something to the draw of the ocean! Another snow storm? Wow. You have had your fair share (and then some) of snow this year. Those tulips are lovely!! I made some salmon this weekend on the grill and all I did was mix brown sugar and dijon mustard together and brush it on top right before grilling. It came out so freakin' good. I have some for lunch today. Ti - That salmon sounds about as simple and tasty as it gets... will definitely try the brown sugar/dijon mix! Hopefully, we'll be able to grill soon. I just bookmarked the fish recipe (I missed it this weekend). During Lent I have to get creative to keep fish interesting. And come on down to Florida baby, the weather is gorgeous! You guys so deserve this. Sandy - I've been checking the Florida weather daily and am loving what I see! Hope it continues into next week. The fish is delicious - I'm sure your family will love it. Glad you are loving Call the Midwife. Your Orangemen are playing our Broncos in the first round. Have a great time in FLA. I am deciding whether or not I am going this year. Nise' - Oh, I didn't know the Broncos were your team... It should be a good game on Thursday. I'm actually looking forward to the treadmill and another episode of Call the Midwife! The tulips are gorgeous! What a lovely way to add a little spring despite the weather outdoors. I wish I had been an audiobook listener when I was reading Middlemarch. It really helps to get through those big chunksters! I bet Juliet Stevenson's narration is wonderful. Wishing you some warmer weather! Your weather is officially worse than mine. Lol. Although we are supposed to get snow by the end of the week it isn't supposed to be as much as you. I don't blame you for looking forward to trading the snow for the sand. I would be too! The tulips are so beautiful. They are one of my favorites. I can't even tell you how much I want to see green and flowers at this point. Darlene - This has been one looong winter and I'm very happy to head south for a little while... fingers crossed that spring has arrived by the time I get back! I hope you enjoy your trip! We just got back from Florida and we enjoyed that sun like you wouldn't believe. Weather weary is a great way to put it...sigh, we got more snow yesterday. It seems never ending this time around doesn't it? Call the Midwife...that's a PBS thing correct? I need to get on that! Jennifer - Glad you had a good trip... that sun is going to feel so good! They're already saying this could be the coldest March in history... and don't even get me started on the snow. Yes, Call the Midwife is on PBS. It's actually based on a book. Season two starts at the end of the month... hoping to get through season 1 in time.